Aim: Expression of PD-L1 in the tumor is associated with more favorable responses to anti-PD-1 therapy in multiple cancers. However, obtaining tumor biopsies for PD-L1 interrogation is an invasive procedure and challenging to assess repeatedly as the disease progresses. 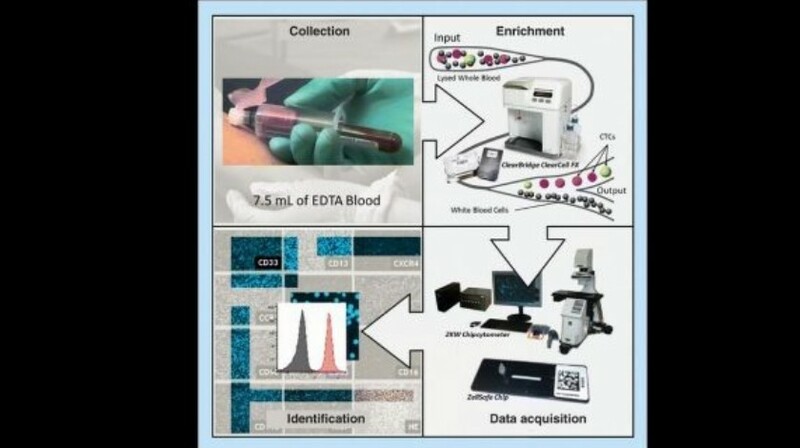 Materials & methods: Here we assess an alternative, minimally invasive approach to analyze blood samples for circulating tumor cells (CTCs) that have broken away from the tumor and entered the periphery. Our approach uses sized-based microfluidic CTC enrichment and subsequent characterization with microfluidic-based cytometry (chipcytometry). Conclusion: We demonstrate tumor-cell detection and characterization for PD-L1, and other markers, in both spiked and patient samples. This preliminary communication is the first report using chipcytometry for the characterization of CTCs.